Yesterday I watched an older episode of Comedians In Cars Getting Coffee by Jerry Seinfeld. It’s the one with Sarah Jessica Parker and her enormous Ford Country Squire from the seventies. A car Jerry borrowed for this specific episode. I think this episode is one of my favorite episodes within the entire Comedians in Cars Getting Coffee series. I really like the chemistry between the two in this episode. I really have no idea if they meet each other a lot in real life but they have this family-like relationship going on which make it really easy to watch and they really pick a few interesting topics in this rather long episode. The best line by Jessica in this episode must be: “Why would reason have anything to do with what people think?”. As Jerry pointed out… I was rolling on the floor first time I heard it, and it isn’t even meant to be funny! To me it really shows they understood the moment they were in themselves. Another classic within this episode is Jerry’s rolling of his eye’s when he looks at the bill. Which Breitling does Jerry wear? Anyhow… the watch. 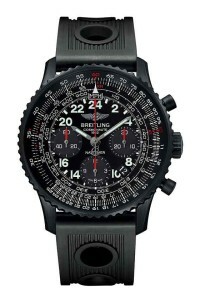 As we know Jerry is a Breitling enthusiast and owns several of them. In this episode it is not that often to see but he wears a Breitling Navitimer Cosmonaute Blacksteel, which is a limited edition. That is probably why Amazon currently only sells a another version of this particular watch. « What watch does Bradley Cooper wear in American Sniper?